Here is the Earth – from the International Space Station. Go full screen and HD. This is what we need to look after and you can clearly see the light reflecting and refracting through the atmosphere. The NASA Climate Change Resource Reel has loads of video and animation clips which download as .mpg files when you click on them. Perhaps more than anywhere else on the planet, the effects of rising temperatures are obvious and observable in the Arctic. From sea-ice decline to shifting niches and threats to biodiversity, the future looks bleak at the north pole. 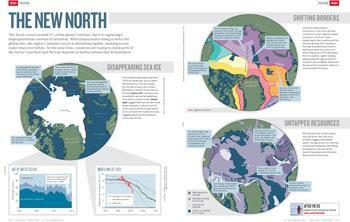 A neat article with a very good infographic, from Nature: Redrawing the Arctic Map. Threats to the Arctic, from the WWF, and a nice summary of the effects of global warming on the Arctic, from CIEL. the Guardian also has an article on the disappearing world of the last of the arctic hunters. Current atmospheric CO2 is measured by hundreds of field stations around the globe, inputting data into the NOAA databases. Use these CO2 data to plot trends and annual cycles with a spreadsheet. Check out CO2Now to see graphics of the most recent data and trends. In this TED Global 2010 talk, Lee Hotz describes the work of researchers in the Antarctic, studying the history of our planet’s climate, through drilling ice-cores that go back in thousands of years. Why did the researchers choose this location? What are their aims? How do they collect data? The NOAA Satellite and Information Service has databases for all the different methods used to gather historical CO2 data. You could also use the Vostok data. Where are we now? In a time of need for resilience and inventive solutions. Click here for excerpts from their post-carbon reader. This funny (but sweary) John Oliver sketch skewers the non-debate on climate change. With 97% agreement from scientists on the human cause of climate change, are the media skewing the debate with 1:1 representation? 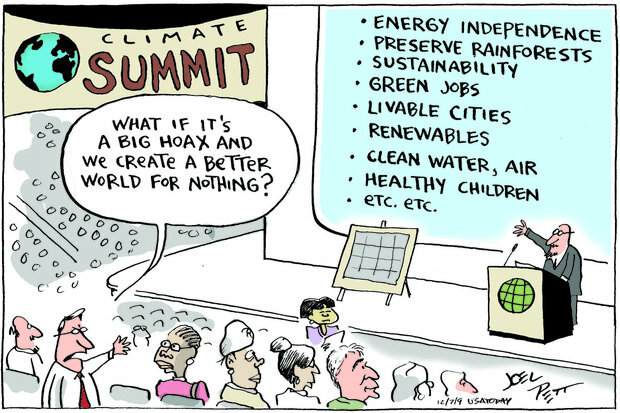 What if it’s all a big hoax and we make a better world for nothing? Joel Pett cartoon. Click to see more. Find out more about measuring ocean CO2 data from the CDIAC. The National Resources Defense Council outlines the harmful effects of ocean acidification. Topic link: how does ocean acidification link to the chemistry of life unit? “The theory that an action should be taken when a problem or threat occurs, not after harm has been inflicted; an approach to decision- making in risk management which justifies preventive measures or policies despite scientific uncertainty about whether detrimental effects will occur“. From Dictionary.com. Find out more from pprinciple.net. So they key issue is this: we suspect that human activity leads to climate change. We are still collecting data to support (or refute) this hypothesis, and the evidence is growing stronger and stronger that anthropogenic climate destabilisation is true. In the meantime, should we wait for more evidence before taking action or should we take preventative and remedial measures now, in order to get a ‘head start’? Finally, a concise article on Why the Global Warming Skeptics are wrong, from the New York Review of Books. Comments have been disabled on this page.